About Roland Barthes’ book Camera Lucida, photography historian Geoffrey Batchen wrote that it sought “to tell us something about photography by itself becoming photographic, by giving us a specifically photographic experience”. This quote came to mind several times during the 10 days of Nuku Photo Festival, billed as a space for photographic encounters, exchanges and storytelling. The festival was a thoughtful mediation on the various relationships between photographer, subject and spectator, without which there is no photographic object/image, from a specifically Ghanaian perspective. In a private conversation with Nuku Studio founder Nii Obodai, who co-established the festival under the umbrella of the Nuku collective, we spoke of the spirit of generosity imbedded within many African cosmologies. The question of how this same spirit could provide guidance as a community came together to build an infrastructure for practice was at the heart of how this festival unfolded. Like Barthes’ seminal text, the festival was representative rather than comprehensive. About the process and practice of photography, of archiving, education, exhibiting, rather than photographs – though there were plenty of beautiful, engaging and moving photographs to be seen. It was the kind of festival that one left feeling as well as thinking, one that recognised that both the head and heart have a part to play in infrastructure building. It closed with a sense of fullness after a series of relentless events across the country that could easily have left participants exhausted. The festival opened with the exhibition entitled Daily Graphic, organised by Francis Kokoroko and Eric Gyamfi, two important young Ghanaian photographers, Kokoroko in particular defining how the country is seen in the digital realm while Gyamfi has put the country’s queer communities into the frame. The exhibition title is a tribute to the largest state owned newspaper in Ghana, which before the explosion of image sharing on social media was the defining space for photographic imagery in the country. Daily Graphic invited viewers to see the contemporary everyday of Ghanaian life through the eyes of both local and international photographers. It provided glimpses as varied as New Zealand photographer Ruth McDowall’s stories from the Yapei Queen, a ferry used to transport yams from the north of the country to the south along lake Volta, to documentation of artist Serge Attukwei Clottey’s community engaged project in Accra’s Labadi township, 360 La, shot by Ghanaian Nii Odzenma. The openings that occurred outside of Accra were much needed reminders that the Accra-centered creative community should look beyond itself in providing resources and infrastructure for the growth of Ghana’s photographic practice. The Lensational project, for young female photographers from the town Ho in the Volta region showed an impressive range of work in Kumasi. Initially meant to be a four-session project, Lensational lasted two years and is a tribute to the type of committed engagement that builds lasting impact. 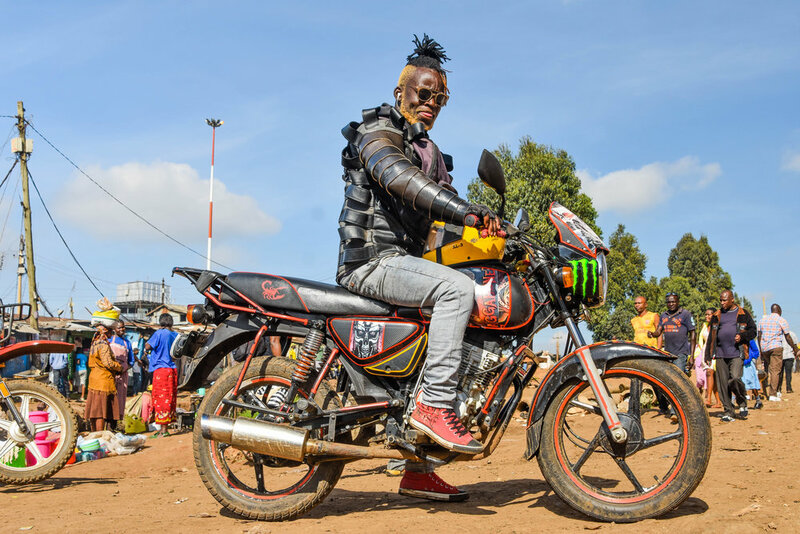 A highlight from their Women & Work show was 23 year old Misper Apawu, herself a female football player, who chose to document the work and family life of a female car sprayer in her series A Man’s Job?. The Northern Ghana Life book launch and exhibition also took visitors outside Accra. Taking place in Tamale, the vibrant capital of the Northern Region, which is little known outside of the country, and surprisingly seldom visited by those in the south. This exhibition took place in the former state printing house, presenting the culmination of a three year collaborative research project between Nuku Studio, Noorderlicht House of Photography and four academic institutions (University of Ghana in Legon, University of Development Studies in Wa and Tamale, Leiden University and University of Groningen, The Netherlands), to document this underrepresented part of the country. 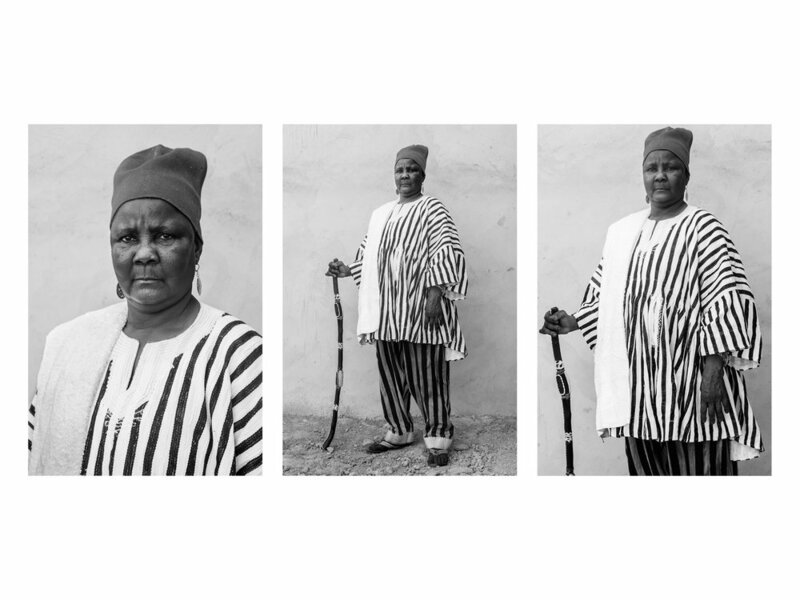 The work that particularly stood out within this space was Patrick Willocq’s One Finger Cannot Pick A Stone, an artistic project in which the French photographer collaborated with local Dagomba people to depict staged interpretations of their rituals. If one were to make a critique of the festival, it would be that it leaned very heavily on the documentary and journalistic with little presence of heavily stylised images, purely self referential artistic projects and those made for made for entertainment value. For this reason, Willocq’s fanatastical images stood out. 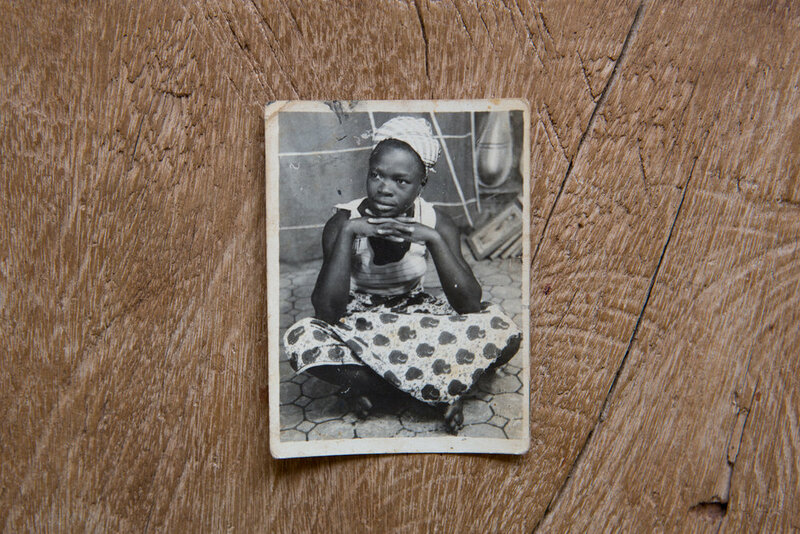 Back in Accra, Mozambican photographer Amilton Neves’ stunning solo show Madrinhas de Guerra (translated as ‘Godmothers of War’), provided a rich and contemplative example of photographic practice elsewhere in the continent. The series reflected on his highly personal journey into the homes of elderly Mozambican women who were part of the National Women’s Movement from 1961-1974. Back then highly influential, these women are now shown in dilapidated shells of once desirable homes gained through proximity to colonial powers. Neves’ comment during the festival’s intimate conference that, “It’s not just about photography... it’s about understanding and caring about the people behind every image you take... This will open more space for you to learn better,” quoted by Nubuke Foundation curator Bianca Manu in her closing remarks, seemed to echo the spirit of care and duty with which those present came to the festival. Also in Accra, Foreseen: New Narratives from the African Photojournalism Database, was a collaboration with World Press Photo and Everyday Africa and a reminder of the fact that there truly is a lot of exceptional photojournalism coming out of the continent. If one was wondering why journalistic and documentary photography dominated the festival, this exhibition showed how much of the continent still remains unseen. It raised the question of the ethical responsibility when telling stories that are easily overlooked to just tell them without attempting to insert too much other than what is there. Highlights from the show were Donwilson Odwaimbo’s portrait of Elchapo, or ‘Bacteria’, of the Kibera slums and Nigerian artist Rahima Gambo’s image of girls clad in their school uniform. Their smiles as they play a schoolyard game give way to questions of collective memory and retrieval of childhood when one understands that their seemingly carefree attitudes belie the trauma of being in the same class as the Chibok girls abducted by Boko Haram. Gambo’s photograph forces us to ask what happens after stories cease to be news worthy. Nii Obodai’s introductory remarks during this opening sums up the spirit with which this festival was put together: “What we are doing is because of the community, because of what the community asks of us”. As much as doing the work demanded by the community, this festival was an invitation extended to the community. This was the spirit with which many left, spurred on to do more and better. The solo show of Martinique-born Nuku Studio photographer-in-residence Robert Charlotte, addressed the exchange between the Caribbean and West Africa through a series of portraits set against the backdrop of Accra’s distance hand lettered P.O Boxes. 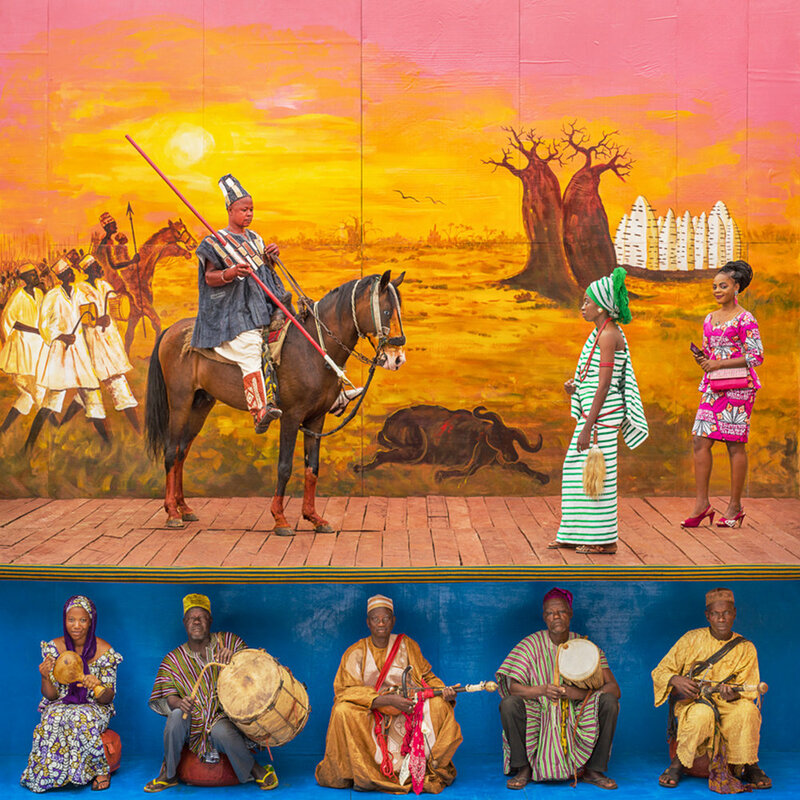 It offered a reminder that the community that the festival addressed existed as various sites and scales and should be understood beyond the boundaries of the Ghanaian nation. The festival closed with Life According to James Barnor at Gallery 1957, which displayed analogue printed medium format images from this legend of Ghanaian photography. This exhibition ended the festival by situating the myriad practices of up and coming photographers on the shoulders of their predecessors, reminding all in attendance that while the community may be small, it has a strong legacy to build upon.